“‘Here comes Ned Moffat. What does he want?” said Laurie, knitting his black brows as if he did not regard his young host in the light of a pleasant addition to the party. Dance cards are one of those things people are always referencing in regards to how stuffy etiquette is. They are a common trope in literature and movies about the “olden days” but how common were they really? And how were they used? Before we get into dance cards, it is important to know a few things about balls from the early 1800s to the early 1900s. Hereby follows a brief history of social dance: In the early period (think Jane Austen times), social dancing was very formal with all the dancers dancing in a big group, moving around in figures, similar to square dancing (rent any of the many versions of Pride and Prejudice to see examples). Because of this, all the dancers had to be in place at the beginning of the dance and had to dance the whole dance. Dance cards were common in Vienna for hundreds of years, but didn’t come into use in England or the US until the 1830s or so. The Viennese custom was probably introduced to the rest of Europe during the Vienna Congress of 1814/1815, which was a big meeting to settle Europe after the Napoleonic Wars. Right around this time was also a shift in dance styles from longer formal dances like the minuet to shorter dances like the waltz, meaning that there would be many more dances in an evening and more partners to remember. Because of this, ladies started taking it upon themselves to write down the names of their partners in small notebooks or on the backs of their fans. Later on, the ball organizers would have cards preprinted with the names of the dances with a space for your partner to write in his name. Upon consulting a dozen or so etiquette books from the mid-1800s to the 1950s, it is unclear exactly how common dance cards were at any given point in time. 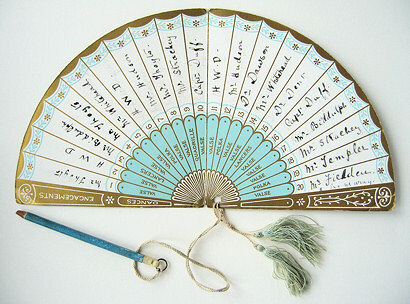 The majority of etiquette books do not mention dance cards specifically and if anything simply allude to “being engaged for a dance.” By the time Emily Post comes along in the 1920s, she says that they are used at public balls and college dances but laments that they are unheard of in fashionable society. 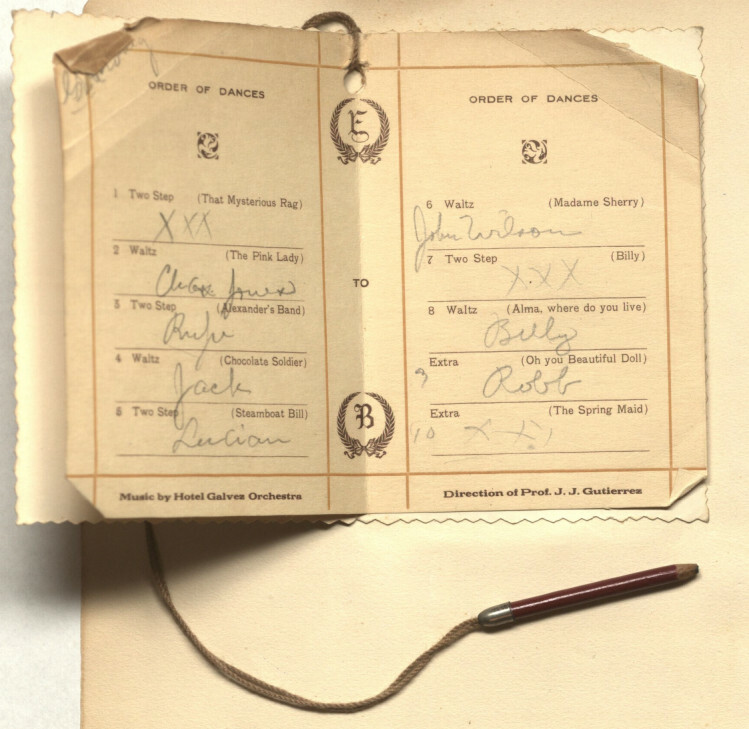 It seems as though when dance cards were used, they would be used to arrange to dance in the future, but if a gentleman asked a lady at the beginning of a dance if she was engaged for that dance and she was not, it would be perfectly fine for them to dance without having to write it down. Dance cards clearly fell out of use when society, for the most part, stopped having formal, set dances. They aren’t particularly useful when you don’t have to know when the waltz, foxtrot, or rhumba are coming up. I think that later on in the early 20th century they were more of a keepsake, being highly decorated and with a list of all the dances and perhaps even the menu of refreshments, than a true way of keeping track of dance partners. Afterall, in the more modern form of social dancing, it’s much easier to quickly ask to dance than it was when dancers were set up in lines and figures that needed to be organized more in advance. If a gentleman other than your father or brother escorts you to the ball, you must give him the first dance and go into supper with him. Many common sayings are derived from the use of dance cards. “To pencil someone in” comes from this practice as well as the more obvious use of “my dance card is full” to indicate a full schedule. Have you ever attended a public ball or dance without a partner? Let me guess, the answer is no, because you’d never write that dance cards being a thing of the past is something to be thankful for! It’s an absolute drag for a woman of any age – even one who’s good-looking and a good dancer – to find a partner if she attends unaccompanied. And no, I am not talking about a romantic partner, just somebody to dance with. I have talked to more than my fair share of women who’ve felt completely left out, because they couldn’t hustle up a dance partner. A return of dance cards would be a marvelous thing, and I say this as a regular ball goer, somebody who can ballroom dance very well, and has attended more than 150 balls in the past 20 years. I thought a downside of dance cards is that only the insiders would get dancers. How would dance cards help strangers?